Last month while I was entering the monthly birthday parties we were scheduled to attend into Adam’s calender, I stumbled upon the entry “Brunch for Nikki”. Before I could stop myself, I asked what it was. Adam said nothing. It was at that moment I remembered my good friend Anna’s 30th birthday in Hong Kong. Her boyfriend was planning a surprise party for her. At every turn she tried to catch him doing it. Finally he got so annoyed he told her everything about the surprise. She was shocked. And speechless. I learned a valuable lesson that day. If someone is trying to clandestinely plan a surprise for you, let them. I never mentioned or asked about the brunch again. The day for the ‘Brunch for Nikki” arrived last weekend. Adam rushed me to our regular brunch spot. It was just us and the kids. The day passed without surprise. I guessed it was cancelled. This morning, however, Adam told me we were meeting some clients of his for lunch before one of the kiddie birthday parties we were attending. So, I dressed nice and made an effort. I wasn’t going to show up in my yoga sweats for clients! Turns out the “clients” were 10 of my close friends holding a surprise lunch for me at Mercat! It was a lovely lunch. Now that I have kids I appreciate how hard it is to ask your partner to cover them so you can go off with your friends to have fun. I was touched that not only all these busy women but their husbands also were willing to do that for me. As if that wasn’t enough, I received another spa gift certificate from the group! Ironically last night when Adam and I were having pillow talk, I mentioned one of my new friends, Sarah, was moving to New Hampshire. Then I complained how I’ve tried to befriend a few new people but it just hasn’t worked out. I thought perhaps it was the universe trying to tell me that, after the twins were born, I would have no time for new friends. After today’s lunch, I think the real message is that I already have more than my share of wonderful, caring friends. This week I received red potatoes, romanesco broccoli, pea tendrils, cherry tomatoes, spinach, butter lettuce, and parsley. I am planning on pairing the red potatoes and spinach together with other ingredients to make a Minestrone Soup. I used a recipe from my Best Recipe Cookbook. It’s super simple. Just add 2 small chopped onions, 2 medium chopped carrots, 2 chopped leeks, 2 medium chopped celery stalks, 1 medium chopped potato, 1 medium chopped zucchini, 3 cups of spinach cut into thin strips, 1 can of 28 ounce chopped tomatoes with juice, 1 parmesan cheese rind, and 1 teaspoon of salt to 8 cups of water. Simmer uncovered for about an hour. Then add 1 can of cannellini beans drained and rinsed. Stir until heated through. Take off heat, add 1/4 cup pesto and take out the cheese rind. I served with a big chuck of crusty whole wheat bread from the bread counter at whole foods. 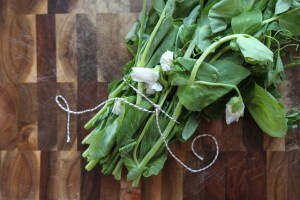 I had never seen pea tendrils before so I wasn’t sure how to use them. From The Cilantropist I learned that pea tendrils, also known as pea shoots, are the young leaves, stems, vines, and flowers of a pea plant. All the parts of the plant are edible. The website also listed some recipes including sauteing them in garlic and oil and putting a fried egg on top, a suggestion from Alice Waters, one of the pioneers for local, organic produce eating. I think I’m going to try that recipe, even though I’m not suppose to eat uncooked egg during pregnancy. They also said you could use pea tendrils in stir fries or as a substitute for spinach. For the lettuce, I chopped it up into the salad I made for dinner last night with cranberries, almonds, feta and some left over rotisserie Costco chicken. I added a home made balsamic vinaigrette. 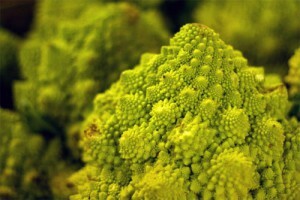 From the internet I learned the Romanesco broccoli was actually closer to a cauliflower, which made me want to steam it and mash it with avocado again. But I might steam it and add a little lemon and olive oil as a side dish instead for a change. Haven’t decided on the cherry tomatoes or parsley yet, but everyone in the house loves a caprese salad so might use the tomatoes for that. Tomatoes are a house staple. We always keep some on hand to slice in hummus sandwiches or grilled cheese, or chopped in salads. Parsley can be added as a garnish to anything. If it sits around in my fridge I can usually add it to enough things that it won’t go to waste. Sometimes I add it to tinned tuna with olive oil, lemon and capers instead of the traditional recipe with mayo. The tuna can go on bread for a sandwich or on top of lettuce for a salad. This week we had another ‘growth ultrasound’. The babies are measuring in the 75% again. This time she estimated they were about 5 pounds each. I can’t believe I’m carrying ten pounds of baby. No wonder I got up to pee three times last night. Heart rates were 136BPM for twin A and 149BPM for twin B. Also, I weighed in at 167 pounds, 5 pounds up from my check up 2 weeks ago and a total of 47 pounds so far. I’m starting to get nervous about how much work it will take to have the twins. Some people have told me they were not able to get their twins on the same feeding schedule and the only way to survive the nights is for the husband and wife to sleep in shifts. I know this will not be possible for Adam, his job is too demanding for him to live off 4 hours of sleep or less a night indefinitely. I can see my dream of breast feeding exclusively for a year drifting away from me. Or the reality that I’ll probably have to give up some fun mornings with Jack and Ben (we hired someone every week day morning during the summer) to get some sleep. This week also starts my weekly non stress test at the hospital. I’ve been scheduled for Friday so I’m not sure what is involved but I’ll let you know in next week’s update. If I’m still pregnant. Lord please let me still be pregnant as long as possible!!! 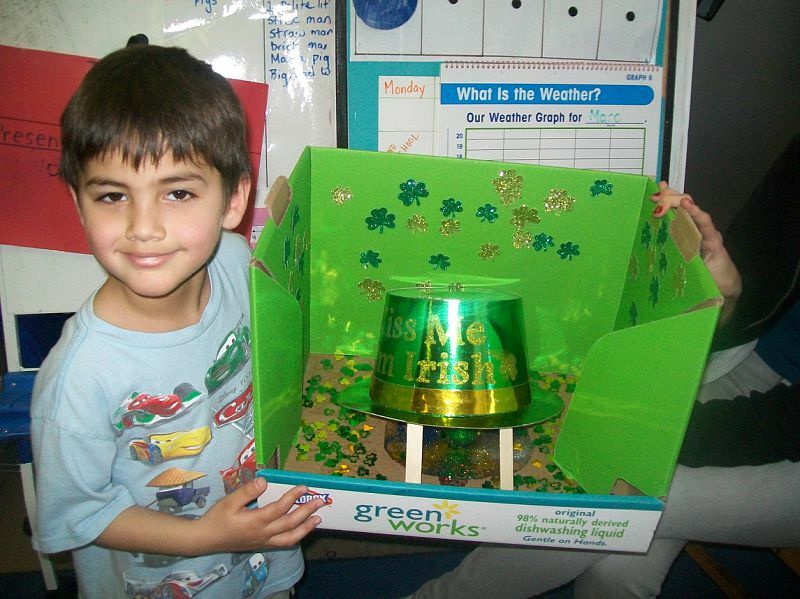 Another cute and fun thing that they do at Jack’s pre-school – Leprechaun Traps. 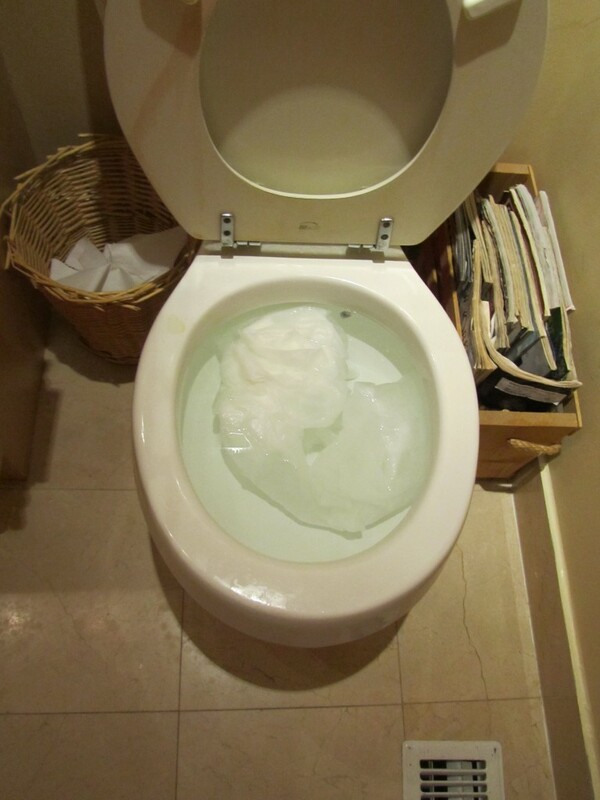 Taking the entire roll of toilet paper and stuffing down the toilet, clogging it completely. We recently visited the dentist for Jack and Ben’s 6 month cleaning and check up. 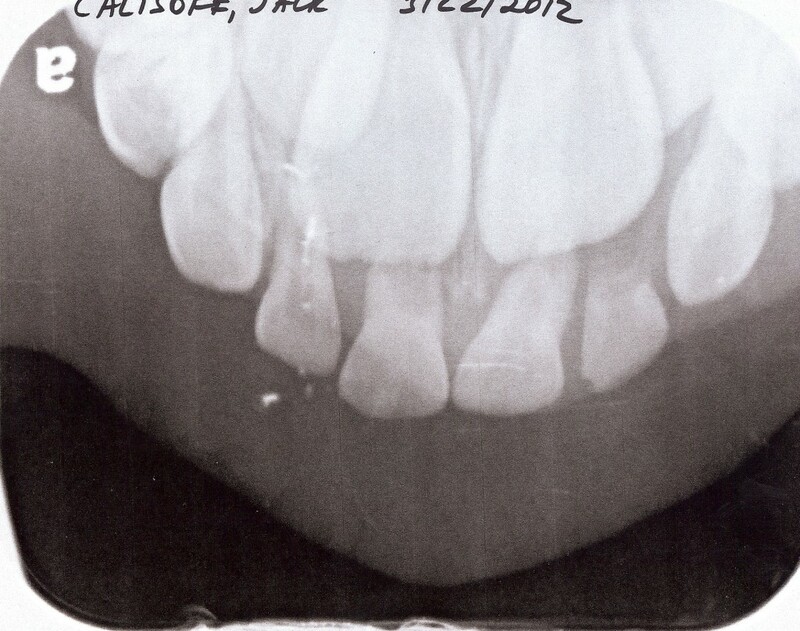 Adam was worried about Jack’s upper teeth. He has already lost his bottom front teeth and we assumed his top front teeth would be next. However, he has been complaining about the tooth next to his front tooth, which for some reason has gone askew. The front teeth look so small now. We weren’t sure if it was because he grinds his teeth at night or just the mere fact of him growing bigger makes the teeth seem small by comparison. Jack’s front permanent teeth are so big they are knocking out four baby teeth. Those choppers are going to be massive. In the end we answered ‘yes’ to about half of the questions in her survey about snoring tied to kids’ risk of behavioral problems. Apparently Children’s hospital sends kids to our dentist to widen their mouths. This helps the children breath better at night and hence helps with their behavioral problems during the day. I don’t think Jack is a candidate for this. I wouldn’t say he’s an angel most days, but I think most of the naughty stuff he does is pretty normal boy stuff. But it did freak me out for an afternoon until Adam came home and talked me down. Although we live in a district with a school that people are applying to get into, instead of just registering, we also applied to the maximum amount of magnet schools that we could for Jack. For Chicago Public Schools, that number is 20 schools. Our neighborhood school is good, but it’s not the best as far as rankings go. Why not try to get into a school with as high a ranking as possible? Today, after much anticipation, our letters arrived today. As I mentioned in my previous post about Chicago School Magnet Applications, the latest ruling on magnet schools states that if you have a sibling in that school you are guaranteed to get in. Of the remaining seats after siblings, 40% will be admitted based on proximity – within 1.5 miles of the school. The final seats are chosen also by lottery but broken into 4 different socio-economic groups. The tiers are complicated, based on a number of things including family education and income. We were able to apply to 3 magnet schools with high ratings that were within proximity. We were very happy to see Jack was accepted to one of them and wait listed at a fairly low number for another. This paves the way for our other kids, who will be guaranteed a spot at the same school. So, the verdict is out. We are not moving to the suburbs. We are raising city kids. Wow. Major life decision solved today. Having twins has challenged everything that I believed in as a mother. When I first had children, I read every book to decide what kind of mother I should be. In the end, I was much more of a naturalist then a scheduler. I believed in baby wearing. I used cloth diapers. I had a hard time letting either kid ‘cry it out’. And I breast fed exclusively, both kids for a year. With one kid it was quite easy, in fact easier than using formula. We were never apart. So I had a great way to carry the milk without worrying about temperature or supply. I used the Bebe Au Lait Breast Nursing Cover where ever I went. With Ben, I learned how to breast feed him while on the run with Jack in my Ergo Baby Carrier. But breast feeding twins exclusively for a year? And run after two other kids at the same time? After much internet research I’ve learned that there is no way to breast feed twins discreetly in public. Which leaves my choices to blatant breast feeding, not feeding simultaneously, or confining myself to the house. I couldn’t stomach the thought of punishing my older kids by keeping them at home during the summer or having someone else get to go out and have all the fun with them while I sat at home missing it. Enter San Diego Bebe Twin. This massive contraption is the only solution I’ve found to breast feed twins in public. 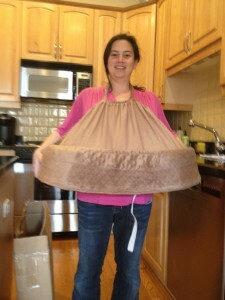 At Adam’s request, I am currently researching twin baby carriers. So far everything looks pretty awkward and/or painful. A few weeks ago Adam’s good friend Jamie came to visit us for dinner. He brought with him some soup from his restaurant, The Soup Box. Adam has been friends with Jamie for a while, before I arrived on the scene. He’s one of those guys who has the winning combination of good fortune and hard work. When I first met him, he had just been voted one of Chicago’s “10 Most Eligible Bachelors”, no doubt a bit of good fortune. He also had just completed the Florida Ironman is a short 11 hours and 48 minutes. Nothing but hard work in that result. I tried the soups back when I first arrived in Chicago and didn’t think about them again until they were sitting in front of me the other night, warm and delicious, with a hunk of crusty, chewy bread to sop them up. They were much better than I remembered. Enough for me to have cravings for them again after our free stock pile was gone. And, as a bonus, they have started serving grilled cheese as well, which makes it a much more kid friendly establishment. I’m not sure how much was luck and how much was hard work to make this concept a success, but whatever the combination, it is a huge success. They are now back on my radar. I like how they have gluten free, vegetarian and vegan options too. The next time you are craving soup, you gotta check this place out! This winter has felt a lot more like summer. We’ve had record temperatures all month. This past weekend we hit temperatures in the 80°s both days. As such, we’ve hit a string of parks in the past week. I’m amazed that this blog is almost a year old and I haven’t written about hardly any of them. But don’t worry readers, we have a summer of fun planned! Lately it seems like a better kind of park to bring Jack to now that he’s 5 is one with a bit of open space to ride bikes, or scooters, or bring a few balls. My excessive husband decided to bring all of those things and more to the park on Sunday. I think the mini-van with all it’s trunk space is enabling him. I must admit all the props made for a very fun morning, not just for Jack but for the handful of other kids who flocked to Adam’s elaborate set up and boyish enthusiasm. 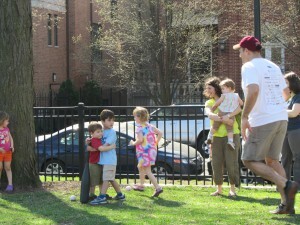 Jonquil Playlot Park is a huge park with lots of fun things to do. There are three play structures, swings, a water element in the summer, picnic benches and ample green space both inside the fenced in playground and surrounding it. There is a huge grassy area just outside of the playground with baseball field and a game table area.